The college search process can be confusing, can’t it? As a college counselor, I’ve answered many questions from parents who wonder how they their high school child can get into a “good” college. You might worry whether your child has the right activities or honors classes. Planning for college doesn’t have to be a mystery! Tier One Tutors asked me to share what parents should know about applying to college on their blog. 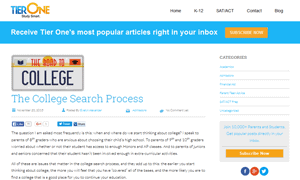 Here’s my article from November, 2015 that explains how and when to start the college search. The question I am asked most frequently is this: when and where do we start thinking about college? I speak to parents of 8th graders who are anxious about choosing their child’s high school. To parents of 9th and 10th graders worried about whether or not their student has access to enough Honors and AP classes. And to parents of juniors and seniors concerned that their student hasn’t been involved enough in extra-curricular activities.